After the scale of that fiasco that took place in 1991, one would have thought that others would learn from this. Well, here are some examples of similar stories that took place after this one. The company later suggested that the word “hooligan” would not be seen as an insult among its customers! David Sheppard probably did not appreciate that disparaging your customers is as bad for your products as putting down your product. Another more recent example of a company owner who thought using humour would help their popularity was an owner of a coffee shop in North Carolina. 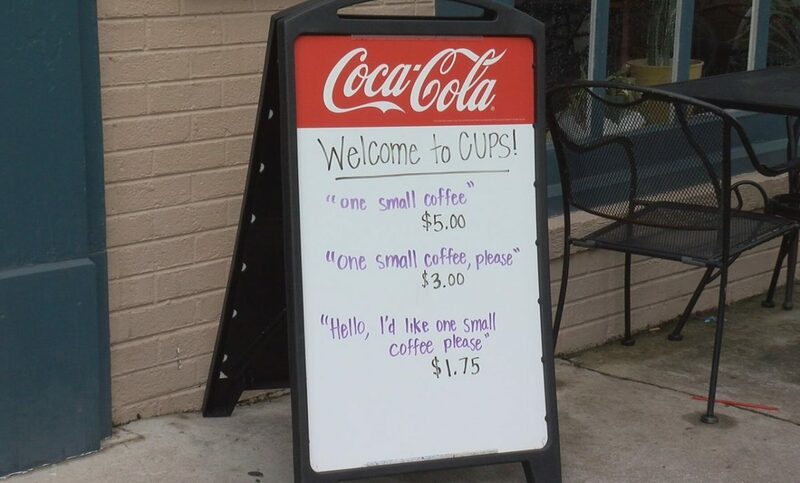 They put a sign outside the store that said “Small coffee” – $5, “Small coffee, please” – $3, “Hello, one small coffee please” – $1.75. It was deemed quite clever and attracted quite a bit of media attention. One news outlet wrote “You’ll always be rewarded for good behavior, and now in some places, you might even save a little bit of cash.” Ultimately however it reflected badly on the coffee shop’s owner and insulted the patrons. No one wants to be told how to behave by their peers never mind by the coffee shop they frequent. If you think about it you will realise that it is quite small business thinking. No large chain such as Starbucks would consider this type of message. The effect of saying what you don’t want your customers to hear is something that can be learned from recent politics. Theresa May’s recent drastic drop in the polls was caused by her revealing a policy to reduce social care. This was attempt to be honest, but was uncalled for, especially so close to the election that she herself called. She did backtrack but ever since that statement her popularity has continued to slide. In the meanwhile Labour carried on doing what most politicians do and just continued making many empty promises that were lapped up by the masses.